You have added Twinkle In Your Eyes Embellished Dress in Coral into shopping cart. The embellished neckline of this party dress adds a touch of shimmer and perfectly frames this look. The Twinkle In Your Eyes Embellished Dress is fully lined and made of chiffon. It has a lined and lightly padded bust, banded empire waist, and a flowy cut. The best part of this dress has to be the semi-sheer mesh fabric panel that wraps around and creates the sleeves of this dress. Rows of clear seed beads add shine to this pretty party dress. A hidden back zipper completes this look. The Twinkle In Your Eyes Embellished Dress is perfect for your next semi-formal event. This would make a cute Homecoming dress! We also think it could work as a unique bridesmaid dress as well. Pair it with beige or metallic pumps or strappy heels and a clutch. Details: Fully lined. Lightly padded bust. Hidden back zipper. 100% polyester. Lining: 95% polyester, 5% spandex. Dry clean only. Small measurements: Length from top of shoulder to hemline: 34". Bust: 33". 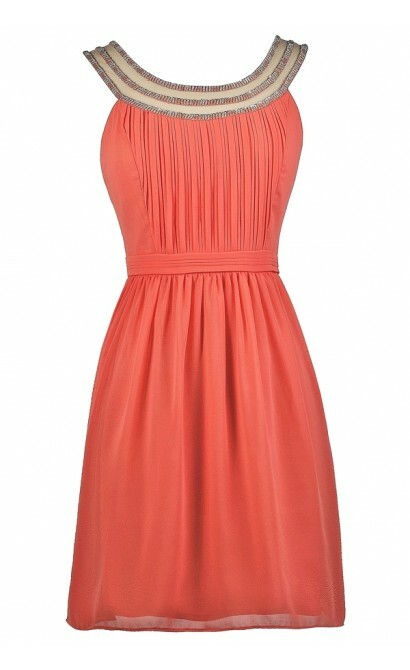 You have added Twinkle In Your Eyes Embellished Dress in Coral into Wishlist. You have added Twinkle In Your Eyes Embellished Dress in Coral for Stock Notification. 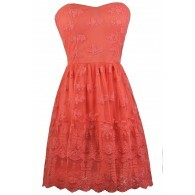 You have set Twinkle In Your Eyes Embellished Dress in Coral as a loved product. You have removed Twinkle In Your Eyes Embellished Dress in Coral as a loved product.